We Charter Per Hour with the Minimum rent 3 hours. 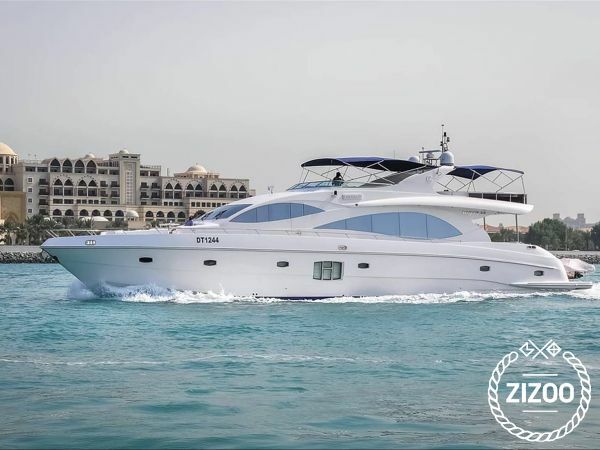 The rate mention is Per Hour in AED Currency With an efficient sea handling capacity, Majesty 88 is a luxurious superyacht with a trend setting design. On the flybridge the facilities of bar and barbecue are unmatchable. Besides world class interior furnishings, the main salon is distinguished by full length panoramic windows enhancing the view of gleaming crystal clear water. The access to the aft deck is monitored by a large center opening sliding door. Its 2 stateroom suites, 1 master and 1 double suite are just what is needed for complete comfort onboard. The main salon serves as an entertainment center fully loaded with state of the art gadgets including TV, DVD, and AM/FM stereo cassette with CD player.